I'm not sure about you, but I follow a lot of people on social media that talk about food and recipes. I have come to realize that just because these food personalities make yummy delicious looking food, they don't talk about cooking basics. How to hold the knife that I'm using to cut up the bell pepper. What is the best way to cut an onion if I need to chop it? Are there tricks to hard boiling an egg that makes sure it is just the way I want it AND is easy to peel? I'm starting a new category of blog posts to address these things, "Cooking 101." I've got a list that I'm planning to address and as I post more recipes, I'm sure more will come up. If there is anything you're interested in learning about, let me know! Simply click the "Cooking 101" category at the top of the page, to get all related posts. This first post will be on some knife basics. I'm sure you know the saying, "there's more than one way to skin a cat." 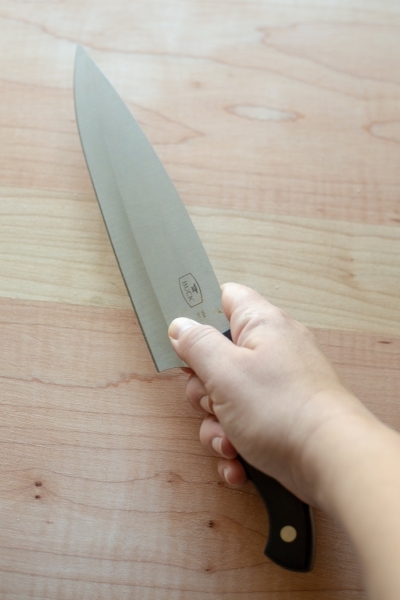 Well, there's more than one way to hold a knife, but there is one way that is preferred among the culinary world and there is a reason for it. From left to right: Pairing knife and two chefs knives. The middle knife has a Granton Edge which creates air between the blade and what you're cutting, making it easier to slice. Now let's talk about grip. In my opinion, this is the most important part of this entry. 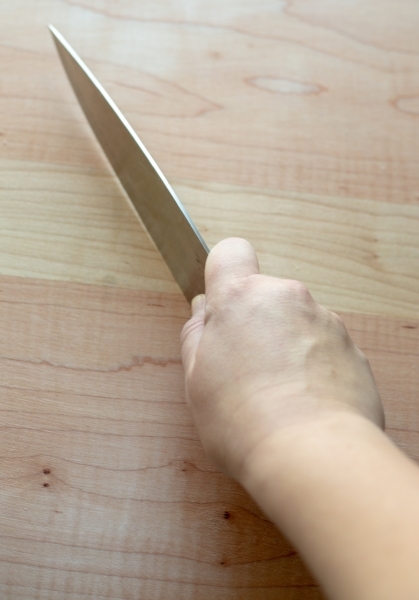 I see a lot of people hold the knife by the handle, putting their pointer finger on the spine (along the top) of the blade. This is NOT the best way to control the blade of the knife. The best way is to grip the handle with your thumb and pointer finger on either side of the blade, and 3 fingers tucked under the handle, guiding it where you want (pictured below). Give it a try and let me know if you have any success! Happy cooking! Let's talk about "Wine Rules"
Thank you for note! I’ll be getting back to you as soon as I’m available!